We are often asked by our many ICEFLO customers "Does ICEFLO integrate with ServiceNow?" The answer to that question is now "Yes". At ICEFLO we take partnerships seriously and are a member of the ServiceNow Technology Partner Program. ICEFLO is a command and control platform for technology cutovers and is used by our customers across a plethora of use cases. In each of these use cases, ICEFLO has defined domains including cutover plans and issues. Cutover plans are often called Schedule of Events (SoEs), Service Transition Plans (STPs), Runbooks or Implementation Plans. Whatever they are called within a customer environment, they all have direct relationships to service management tools. 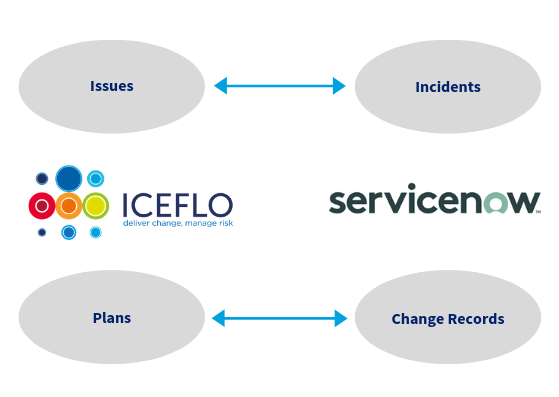 At ICEFLO, we have taken ICEFLO issues and integrated them with ServiceNow incidents. This enables cutover teams to manage issues as part of the cutover process and to seamlessly transfer significant issues to the BAU incident management teams and process when appropriate. Our upcoming release will also include cutover plans integrated directly with ServiceNow change records. Both integrations are bi-directional between ICEFLO and ServiceNow. There are many possibilities when integrating ICEFLO with third party tools. We do this using our ICEFLO Integration Hub and work with our customers to understand your needs, to deliver relevant integrations that your business requires. Interested in finding out more? Please get in touch to discuss your requirements.